Pardon my high school Spanish but these flowery kitties practically meow for language more florid than mere English. 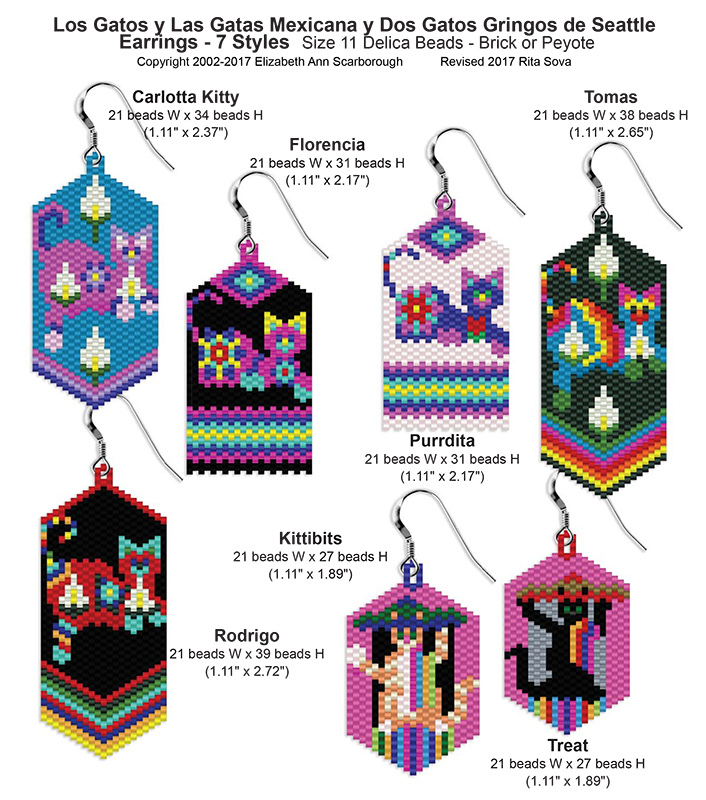 This pattern packet features nice big flat graphs of all of the Mexican folk art cats so far, Rodrigo Gato, Tomas the Turquoise Tomcat, Carlotta, Kitty of the Calla Lilies, Florencia the Flowery Fuchsia Feline, and Purrdita the Purple Pussycat. They are joined by Treat and Kittibits, the Seattle Cats, in their Cinco de Mayo outfits to give you a total of 7 possible pairs of earrings. Change the colors around and get even more! Size 11 Delica bead numbers provide along with quantities. Color graphs with symbols for all 7 patterns. Word Charts for all 7 patterns, Odd Count Flat Peyote.